Showing the artistic side of me. I do Photography & Paper Crafts. And I like sharing DIY projects that I find on pinterest that I want to work on in the future. I know I haven't been on here lately. To be honest I haven't had anything exciting to blog. That is until now. a) Of all the cuteness! 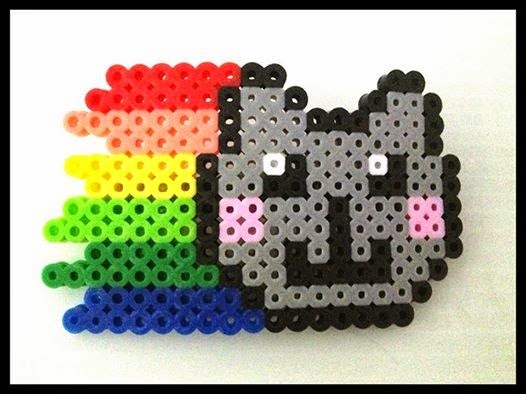 Now, I love my Eeveelutions, but I fell in love with Nyan Cat before I really got into the whole Eeveelutions thing. But anyway, I want to show off my prizes that I got from one of the competitions I entered. This is from the lady over at Scarlet Sparkle Jewellery. You should definitely head on over to her Facebook Page and check out all the cool and cute things she makes. I fell in love with these Eeveelutions Necklaces and I was going to save every bit of my money to get them. 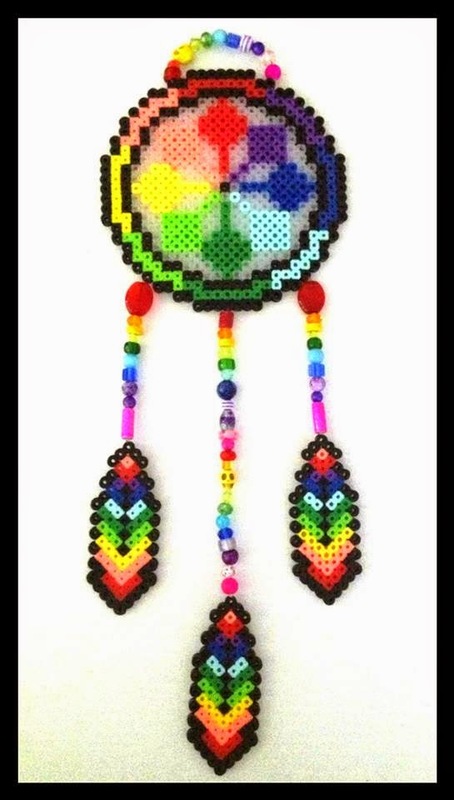 And I saw this Dream Catcher after I wanted the Eeveelution Necklaces. And this my absolute favourite after going through all the photos (other than the grumpy cat I also saw - and now saving up for). I haven't stop wearing this. I love it way too much I think. I can definitely tell you that there will more posts like this one in the future. Ok so I know I haven't been non here in a while. I have had a bad case of writes's block, and I still have it. But while I've been going through that I have been making a few hair bows and I also got around to making a choker. 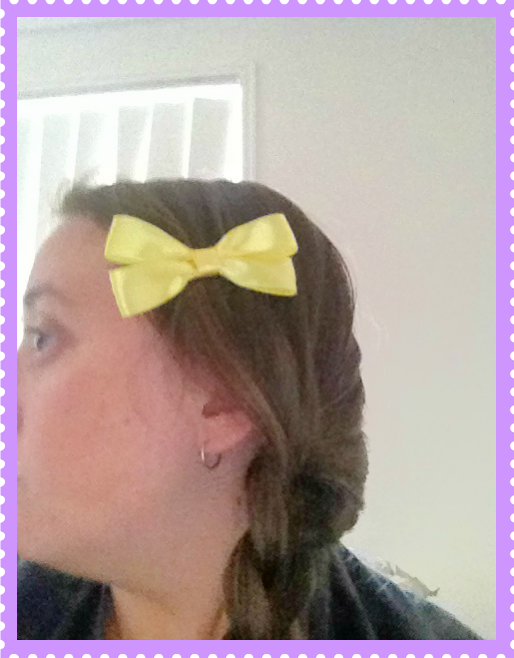 I am still working out the kinks in both my hair bows by finding easier ways to make them. And I also need to work on a tutorial on my choker. But for now, I just want to show you what I have been doing in the mean time. 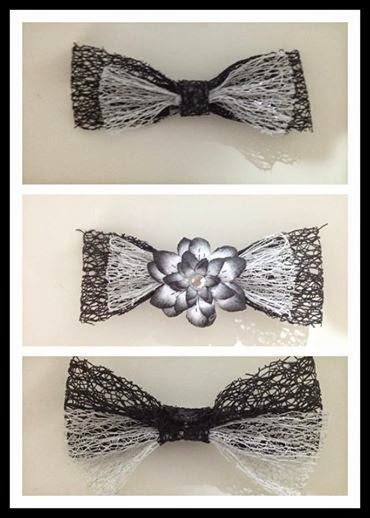 The first two pictures are my hair bow that I have been practicing. This time I am using a mesh ribbon with just some double sided tape and my hot glue gun. As I keep practicing, I am getting more better at it and now I have a lot of awesome bow ideas that are coming to mind. I might have to start sketching some of these ideas to remember what I want to make at a later date and when I have the right materials. My first use of the mesh ribbon. I actually recommend using this type of ribbon as it isn't flimsy like the satin ribbon. Slightly getting better at making my bows. As much as I love using the satin ribbon. The mesh ribbon as become my favourite to use. I did do a test choker just to see how well it would turn out for me. 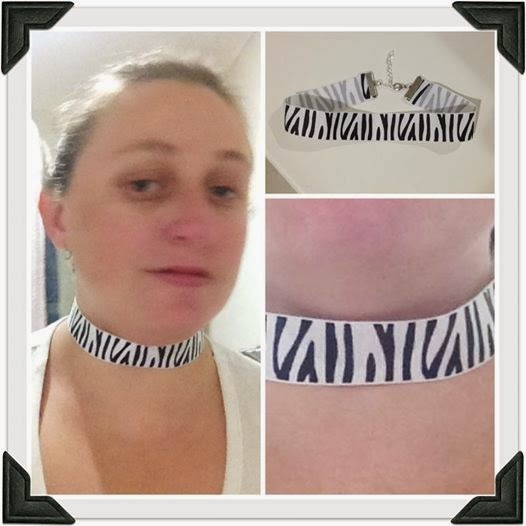 I pretty much followed the instructions from Lady Spleen, and her Diy Velvet Ribbon Choker. Now even though it looks plain. It was the whole point to it being a "tester". I didn't want to make something that wasn't going to work for me. But in the end, it actually came out better than I expected. 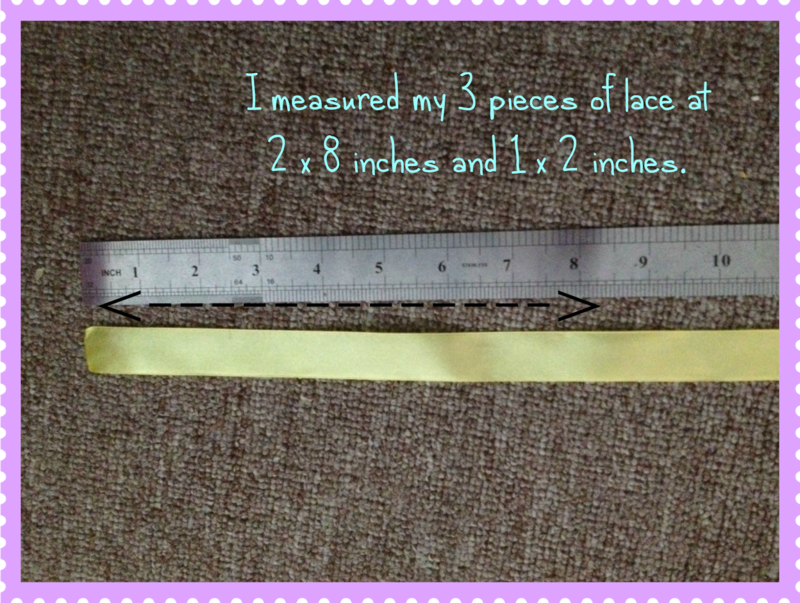 Yes it was a little loose around my neck as my measurements were off by a centimeter. Then the next day, I decided to play it up a little and try a satin ribbon choker. This time adding a Dolphin Cameo. 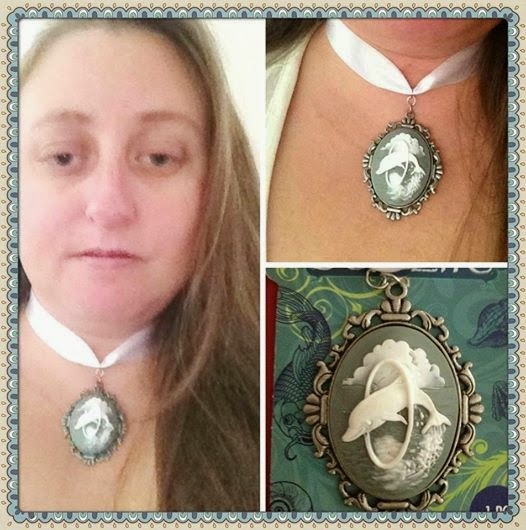 My Dolphin Choker that I'm quite proud of. I have to say that I am quite proud of this one. It's only my second choker that I made, but I just absolutely love it. Who doesn't love hair bows? I have only recently stated liking hair bows. Now I am not really a girly kind of girl and don't really wear bows in my hair. But I have come to fall in love with all kind of bows like cute cats, music notes, superheroes etc. 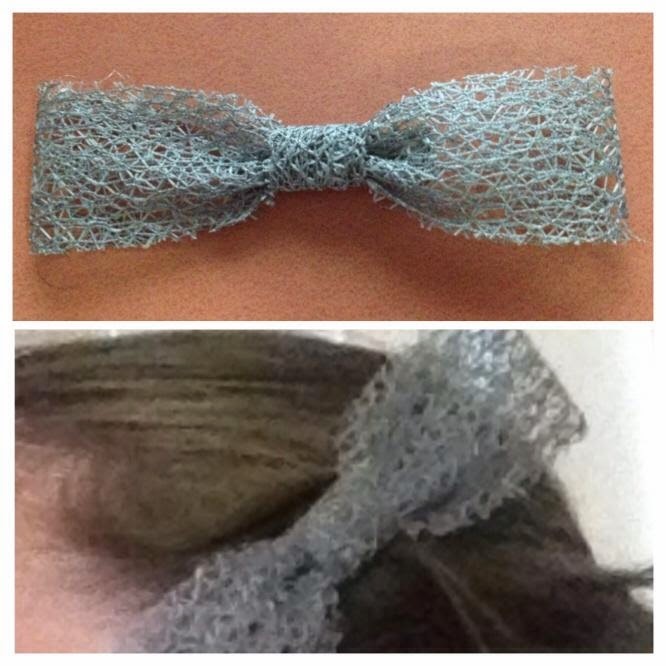 And I can't wait to make more of these in different styles as well as fabric bows and expand my hair bow collection. 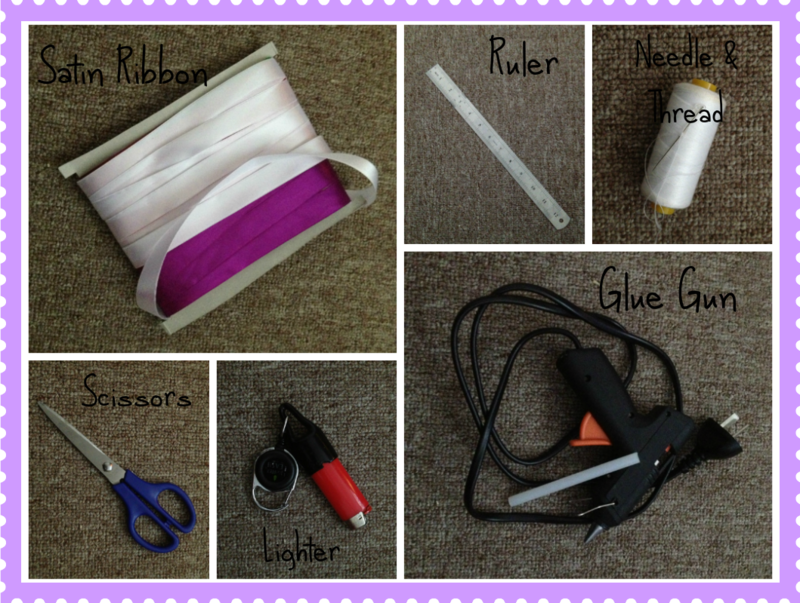 I was inspired to write my own tutorial from Instructables and The Ribbon Retreat Blog, while I was searching for hair bow tutorials on Google. 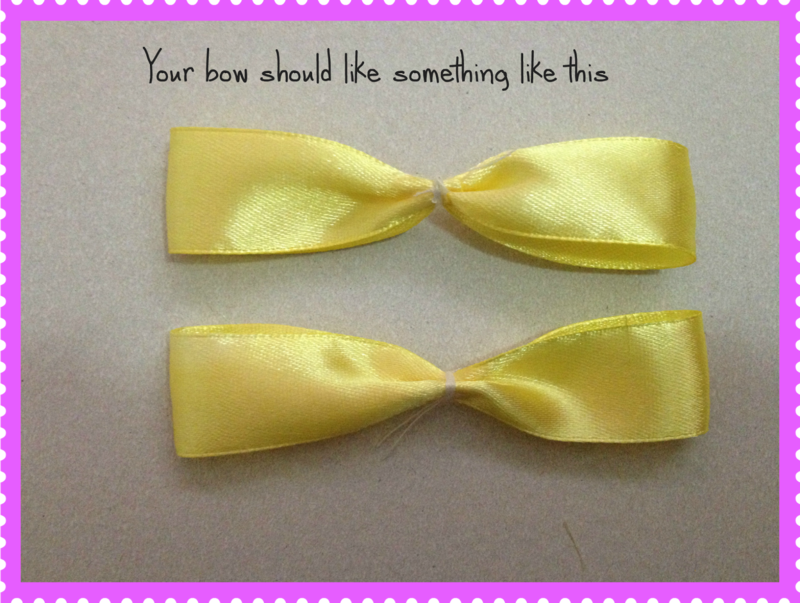 I am going to do my best at showing you how to make a Satin Bow. 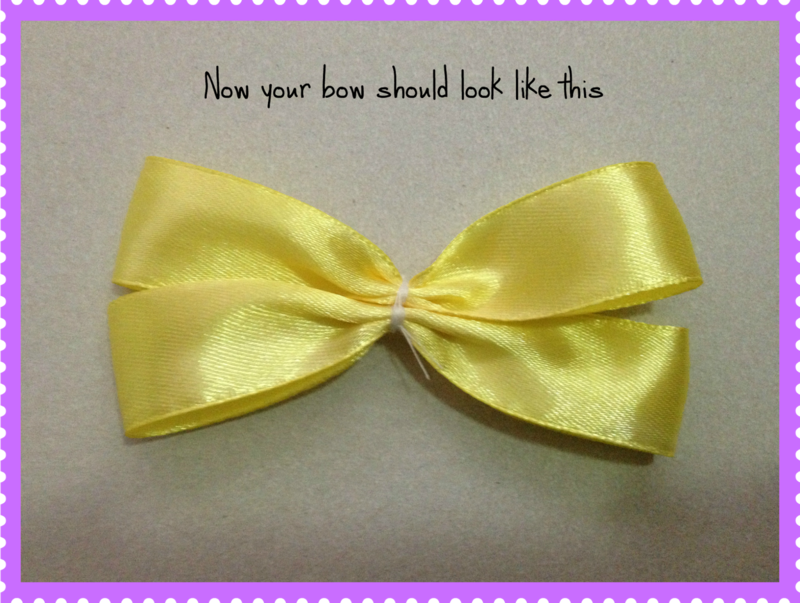 My first satin bow I made. I do hope my tutorial will be easy to understand. I tried to get as many pictures as I could for this tutorial. 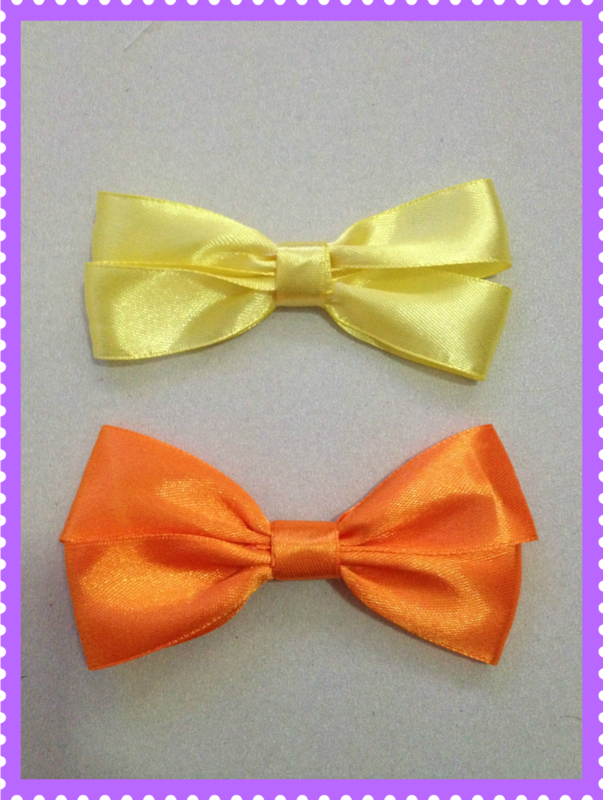 And I hope you enjoy making and wearing these lovely satin bows. *If anyone wonders why I have a few different types of backgrounds, it is because I had to do a few takes with this tutorial.... I did make a joke on Facebook that it would take me all day. Turns out it did! And I also tried to make it the one colour purple but I didn't quite get there. You need these materials to make this bow. First you need to cut your ribbon. 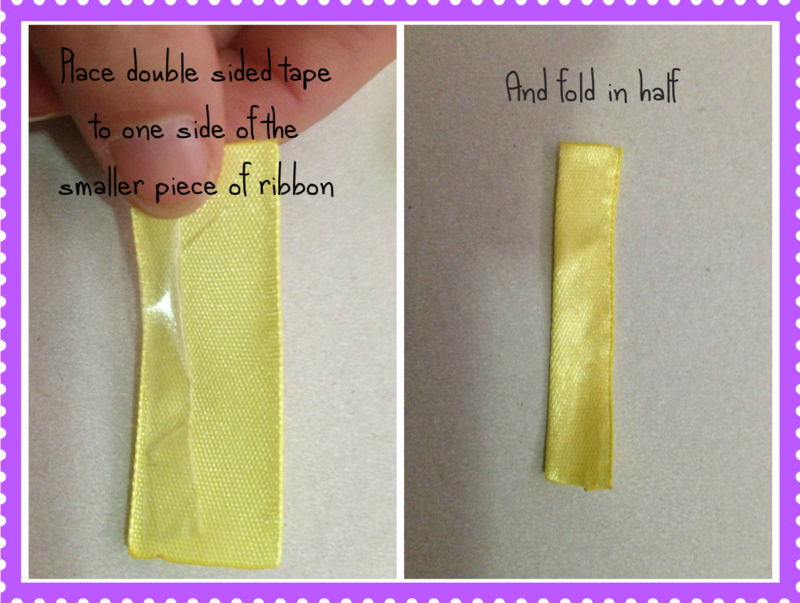 You need 2 strips of 8 inch ribbon and a small piece at 2 inches. 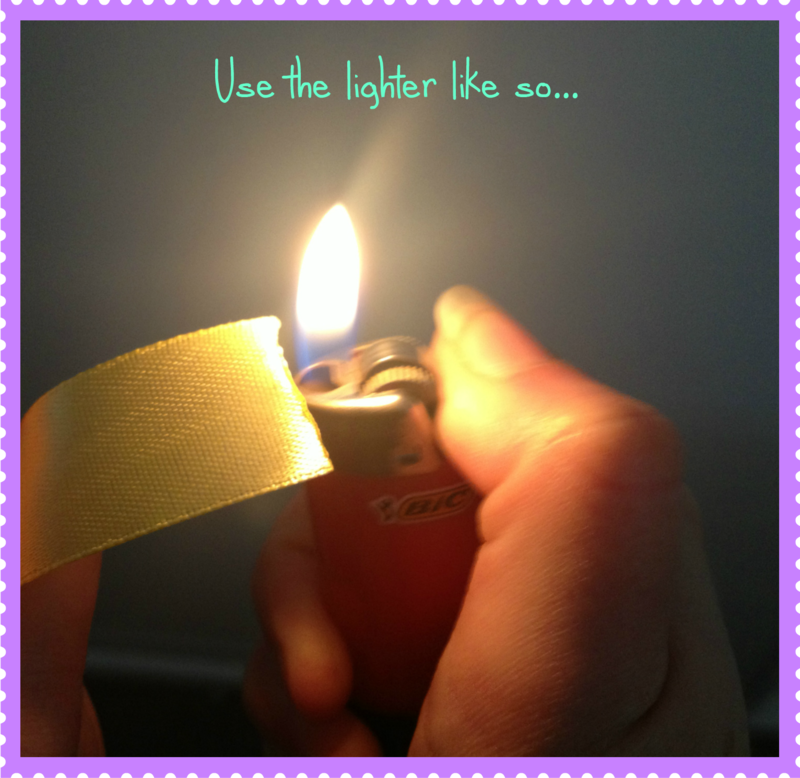 Seal your ribbon ends by ether using your preferred method or by using the lighter. Like I did. 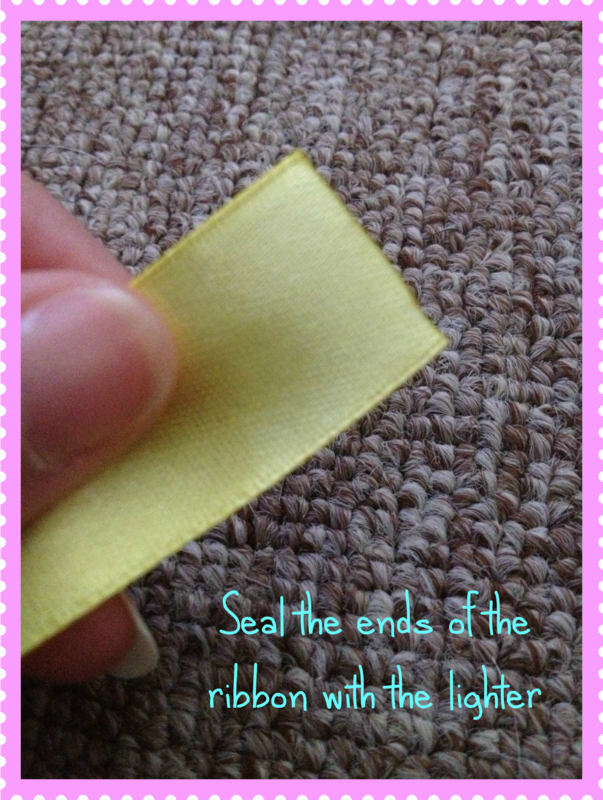 Now get some double sided tape or fabric adhesive and put it on one end of the ribbon. 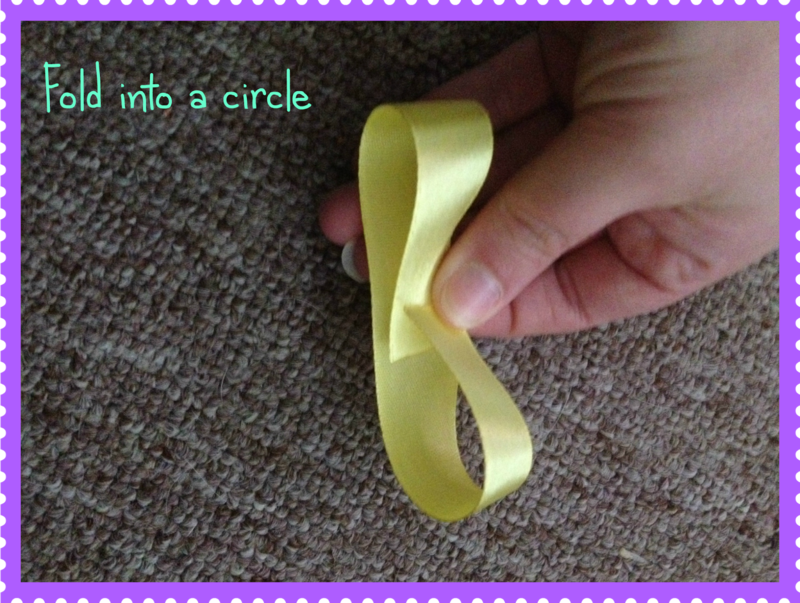 Fold the piece of ribbon to the other end over to make a circle. After you thread your needle. 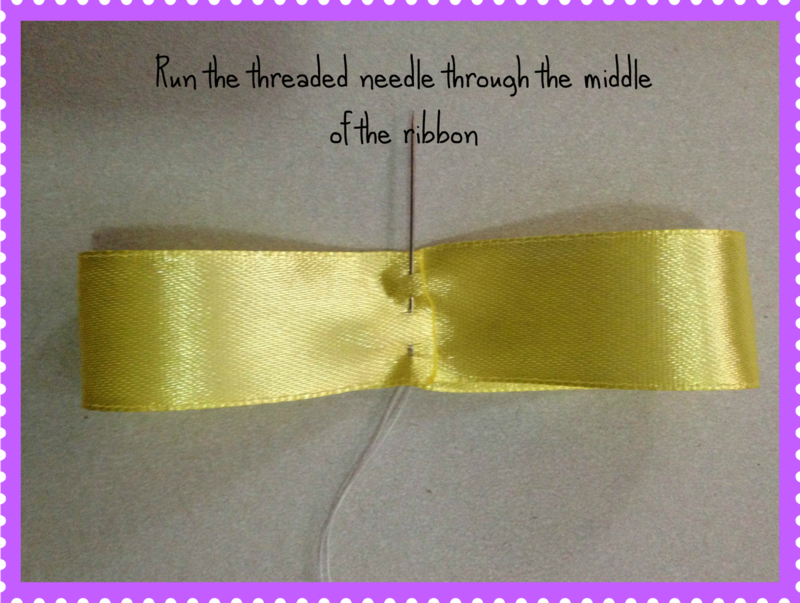 Run the needle through the middle of your ribbon. 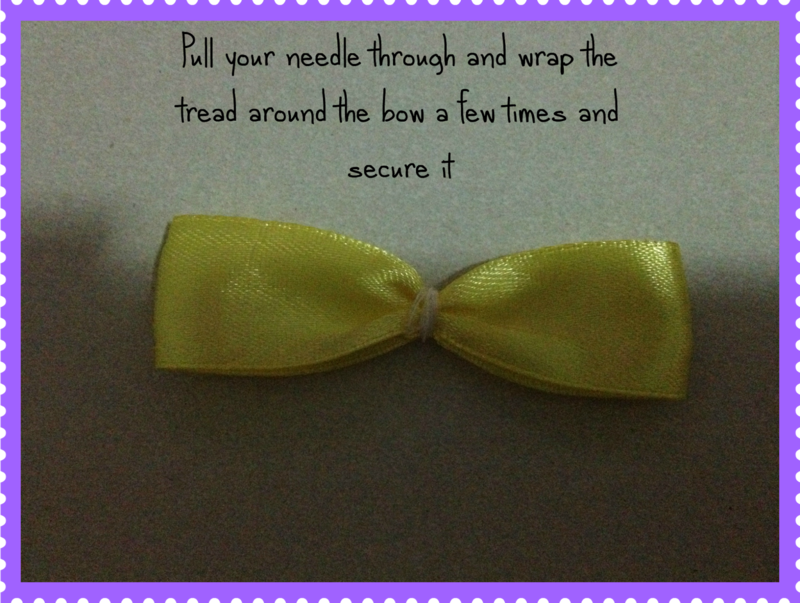 Pull the needle through and wrap the thread around the bow a few times and secure using the thread. And here is your first bow done. Now repeat the previous steps to make another one and you should have two bows that look similar. 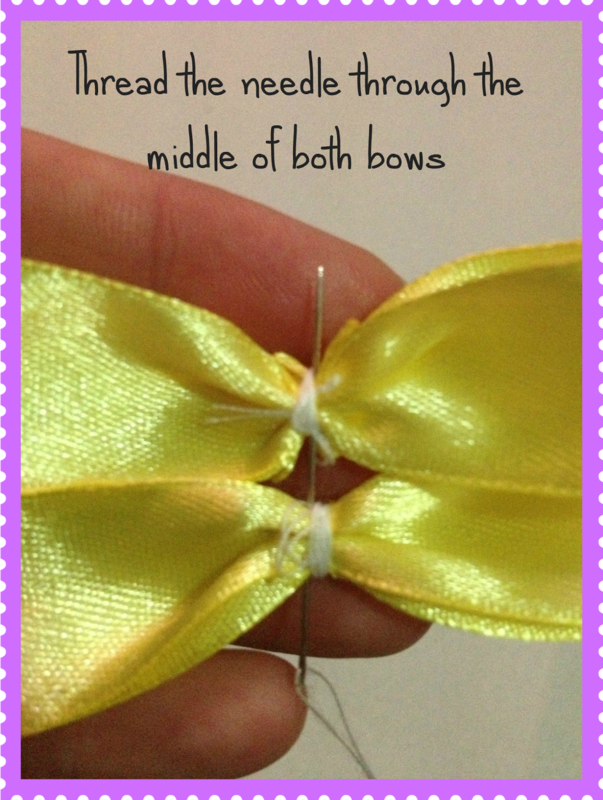 Using your needle and thread again, stitch the two bows together like you did with the singular bow. And now you have a bow just needing the final touches. 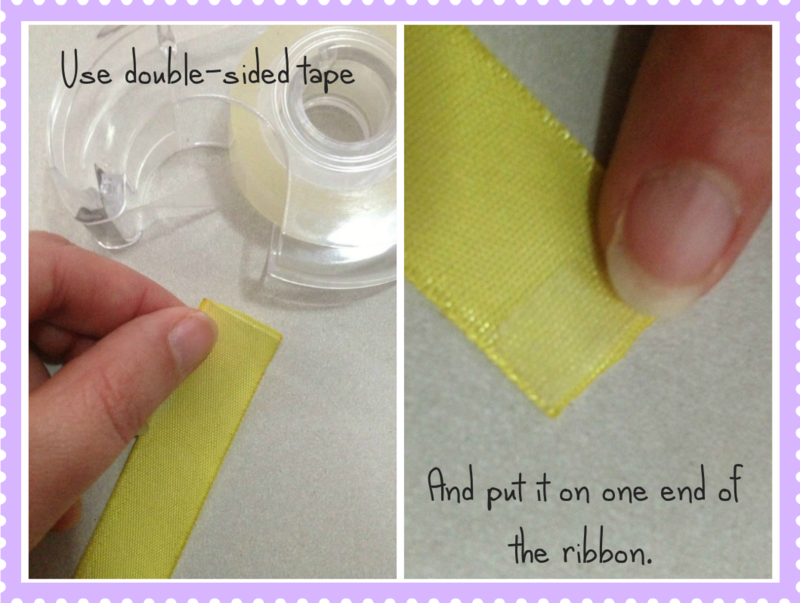 Now using the smaller piece of ribbon, get the double sided tape (or fabric adhesive) and stick to one side length ways. then fold over. 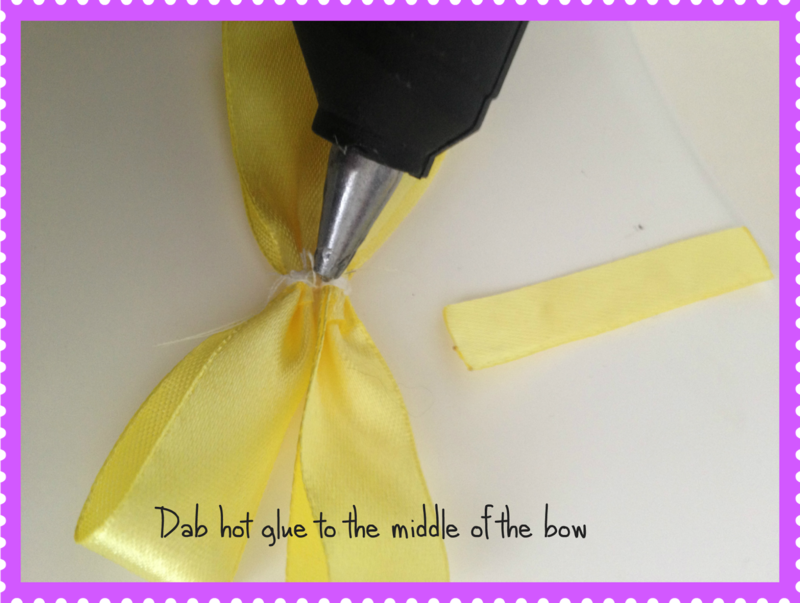 Dab some hot glue to the middle of the bow and place one end of the smaller ribbon over the glue and hold for a few seconds. 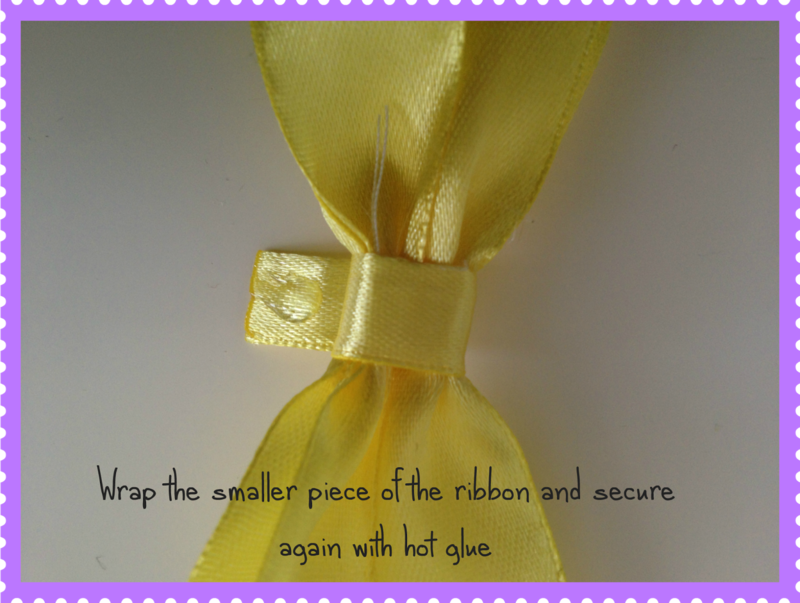 And wrap around the middle of the bow and secure the end with another dab of hot glue. Trim off any excess ribbon. And voila! Congratulations you have just made a bow. To make these wearable, you will need a crocodile clip. 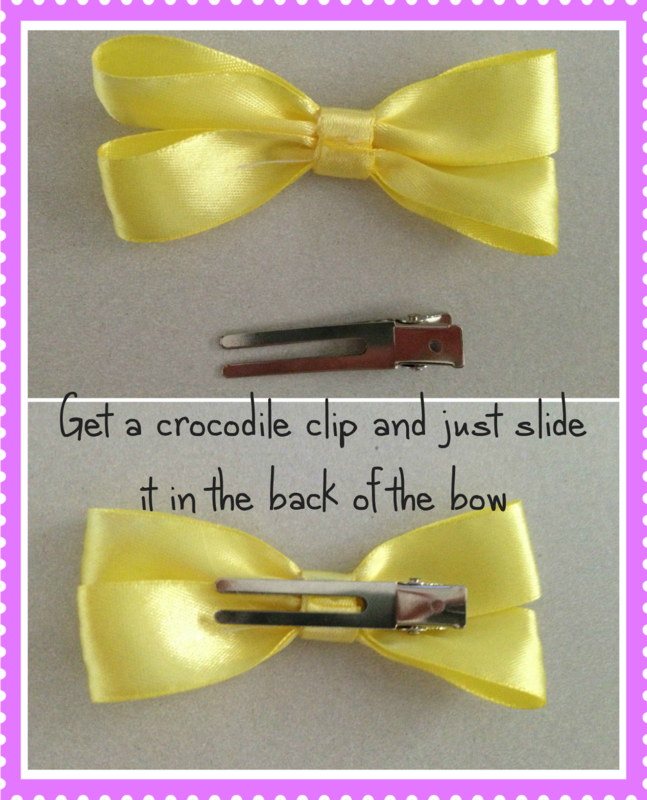 Get a crocodile clip and just slide it through the back of the bow where the crease is. 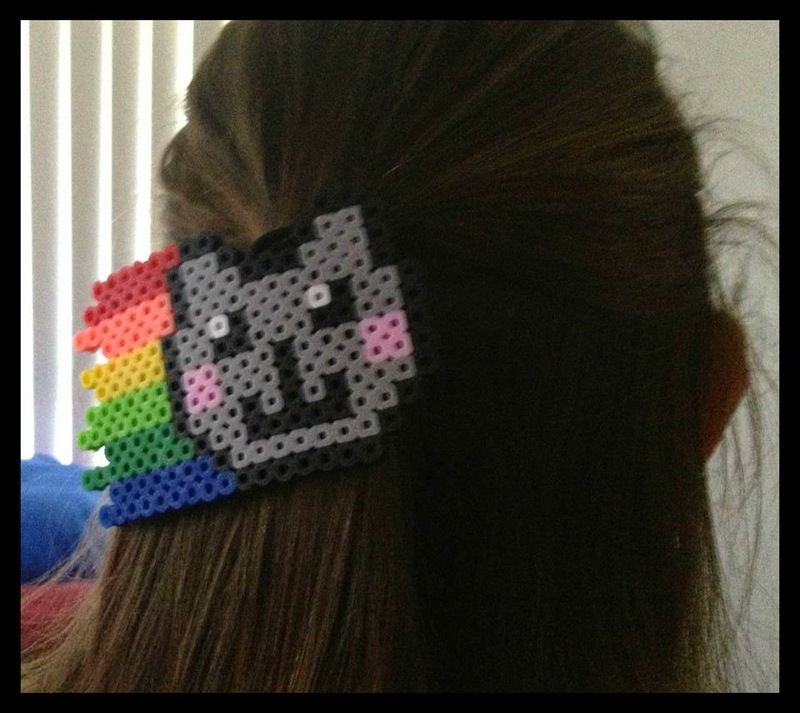 And that concludes my tutorial on how to make a Hair Bow. I do apologize with how long the post is, but I wanted to make sure I got all the steps that I went by. It also took me two days to create this post. Who would have thought that this would take me this long to write it. I am working on a Sailor Moon project that requires me to use aluminium cans. 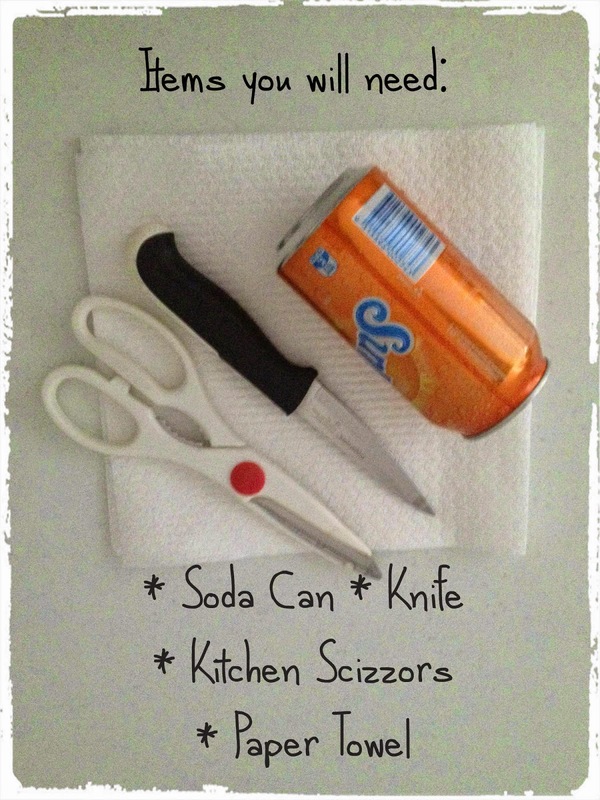 So I thought in today's post I will guide you on how to cut one. I will be working on a video sometime at a later date. 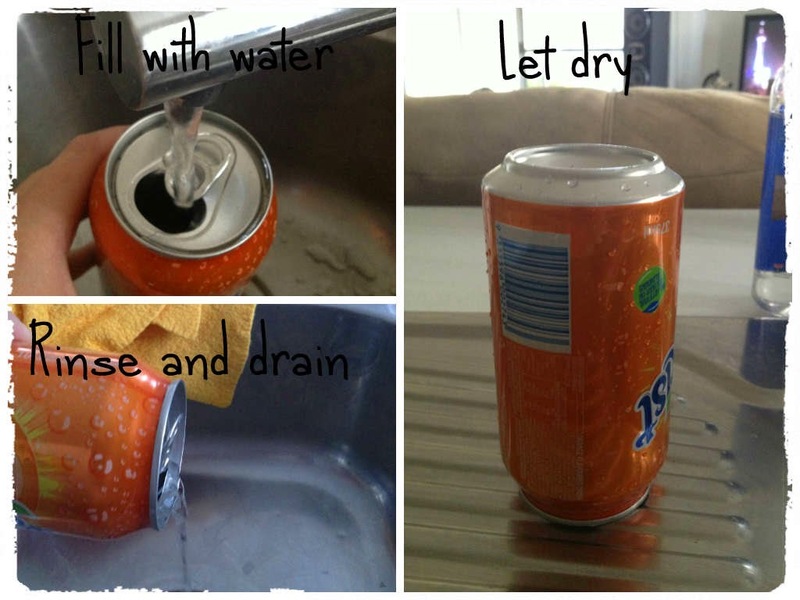 The first thing you need to do is rinse out your cans and let them dry. Now before you start cutting your tin can you should be very careful as to not cut yourself or getting any tin shards in your eye. You might want to get some protective goggles and a pair of leather gloves for your safety. I didn't have these on hand so I was extra careful when I was cutting and taking my time with care and patience. 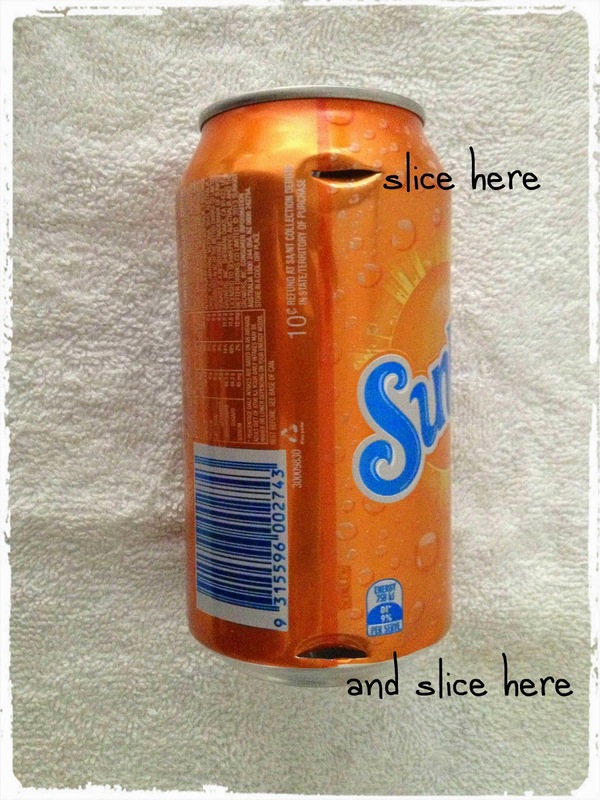 Puncture two holes in the can with your knife. 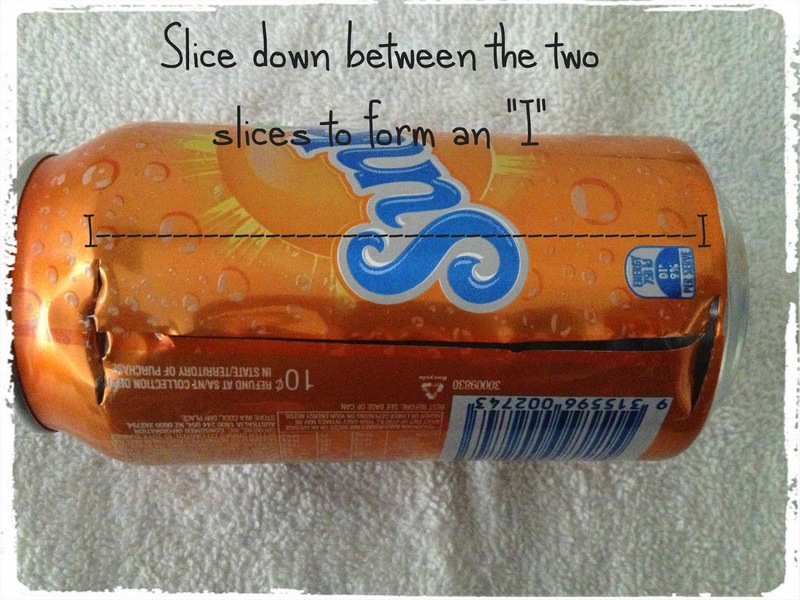 Now use your knife to cut in between the two punctures to create an "I" figure. Like so. 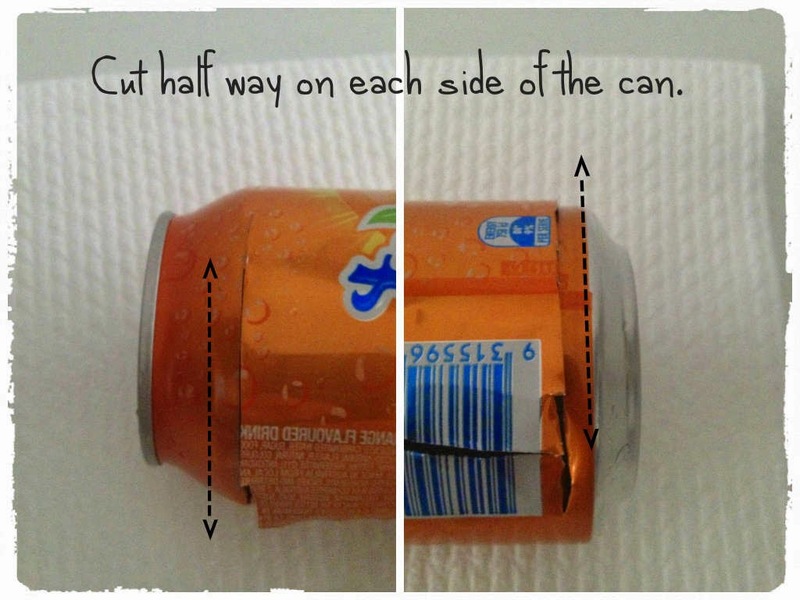 Using your scissors, start cutting along one side to about half way then flip over and cut all the way through to the end of the can. Then finish the other side. 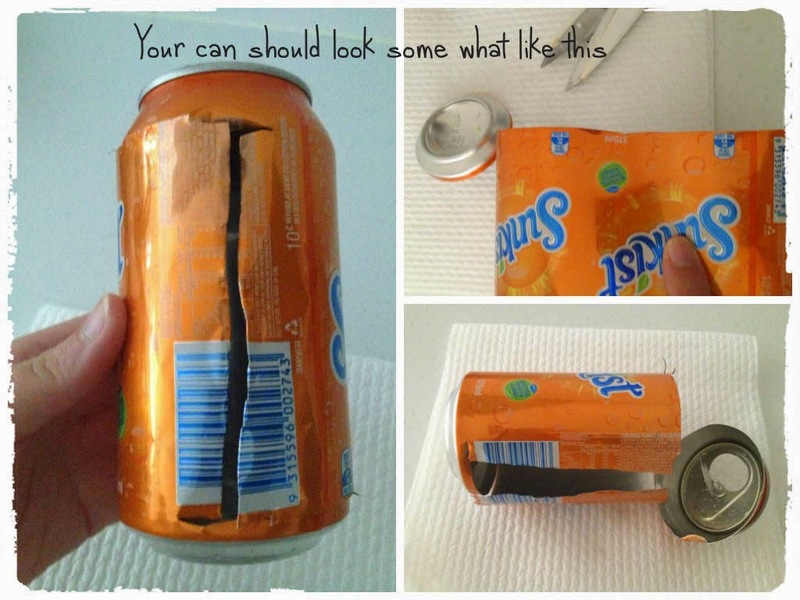 Now your can should now look like this. 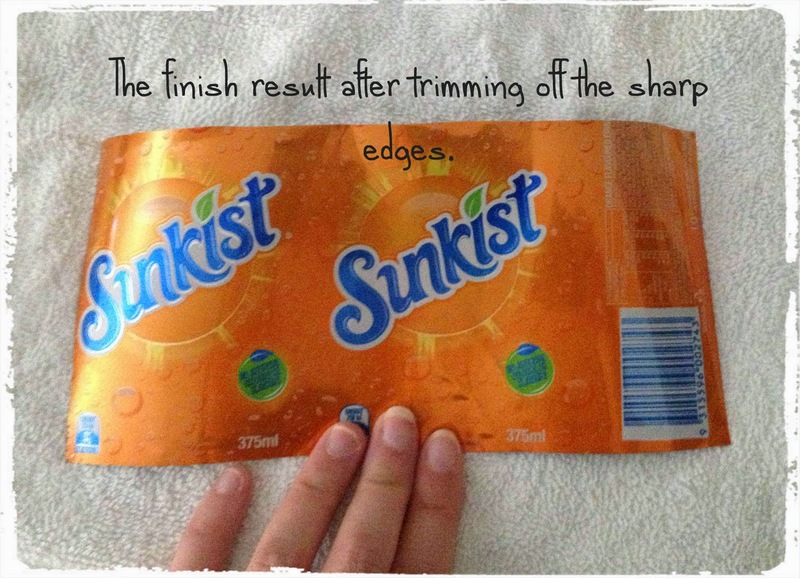 Trim the edges to get rid of any sharp bits. 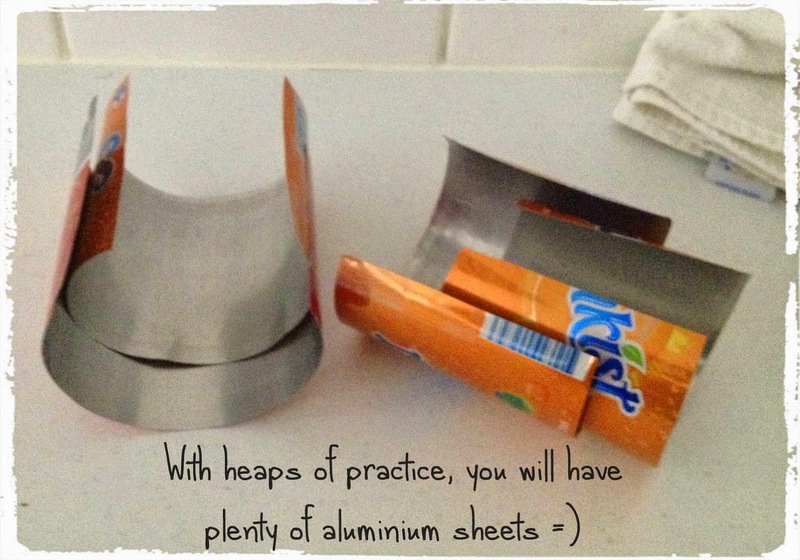 And you have yourself a piece of aluminium. 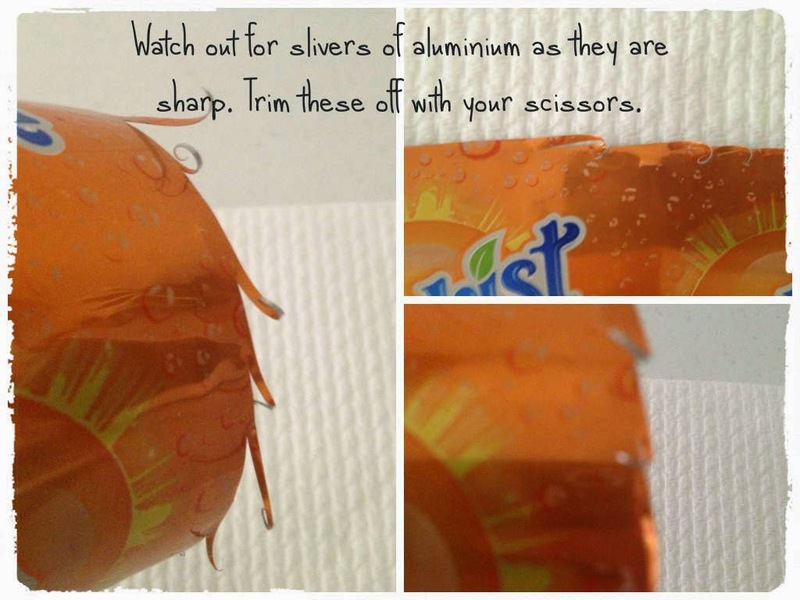 Stay tuned for part 1 of my Sailor Scouts Tiaras made from these Aluminium Cans. 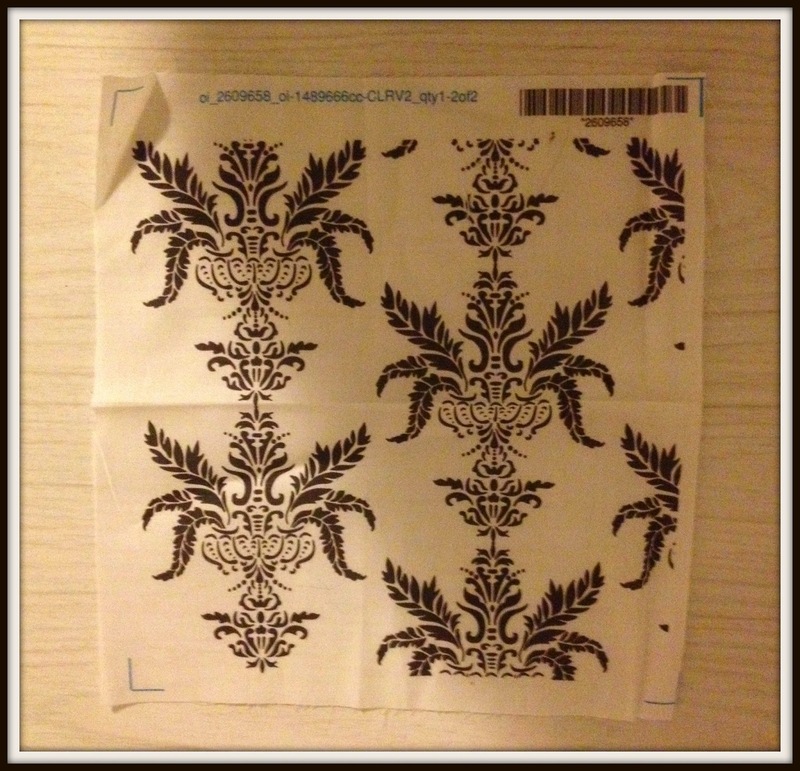 Just a quick post showing what else I did with my samples I got from Spoonflower. I do love the fabric swatch I got and can't wait to turn it into a hair bow. It is going to look awesome! 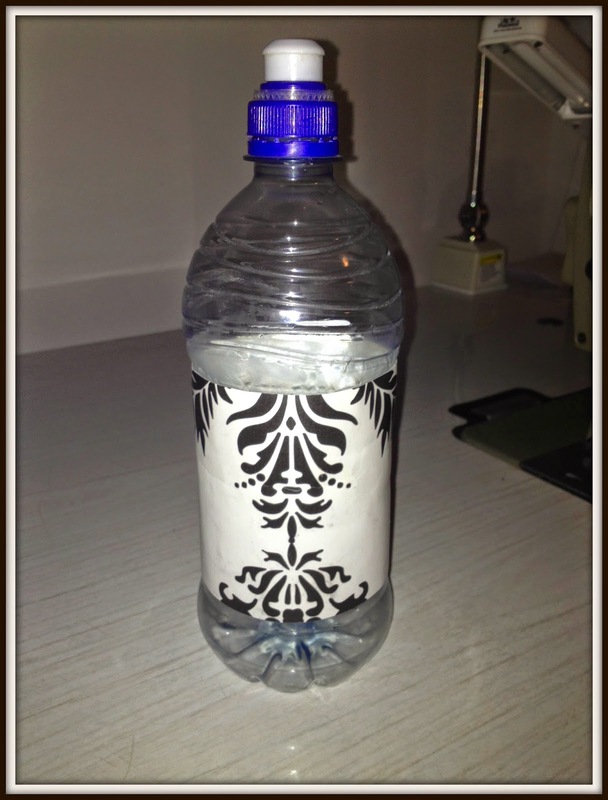 And here is my water bottle. This was the very first thing I made with the wallpaper sample and I just love it. 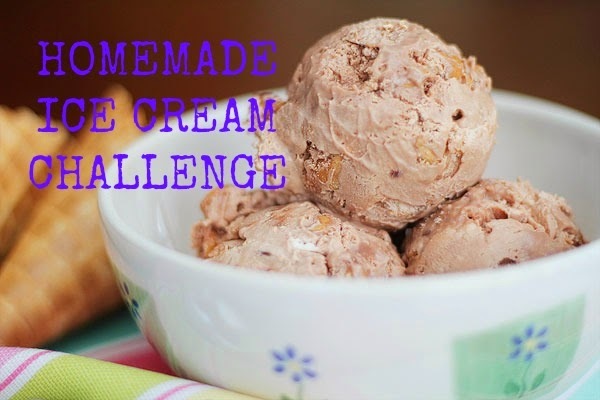 I have been challenged to make homemade ice cream. And the biggest clincher is that my partner wants to get in on the challenge. My partner wants to make a coffee and vanilla ice cream. And I am wanting to do a chocolate cookie dough ice cream. Looks like I will be hitting the recipes sites to help me make this awesome ice cream! New additions to the back potted garden. Just posting up a couple of new plants to our outdoor area of potted plants (I will blog about the other plants in another post). 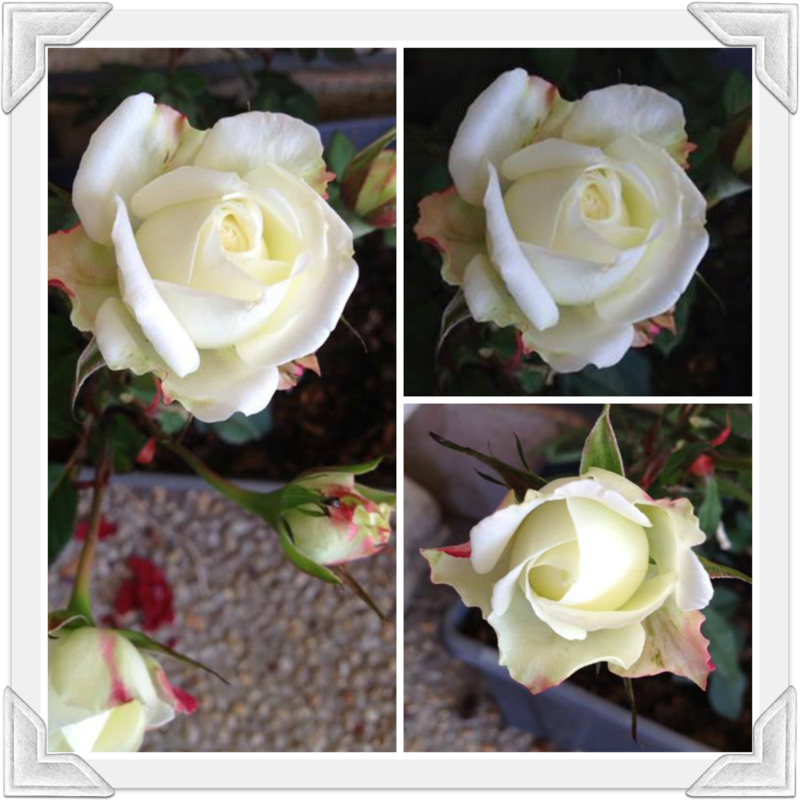 When I was growing up, my dad's house had some wonderful scented roses growing. And ever since then I have had a love for roses. It's not the first one on my flower list, but its in the top 5 of my favourite flowers. But because the house I'm living in is a rental. I have decided that any plant I want to grow would have to planted in pots. Which is good in my books, as I love pots. Now the reason why i'm talking about roses is this little miniature rose I recently got. I don't have room for the normal sized roses that are out there so I collect miniature roses. They are the perfect sized rose for me. And they can come scented. You just need to look for them. The next addition is another miniature (well technically is a dwarf). And I use these a lot in my teas and baking. If you hadn't guessed by now, it's a dwarf lemon tree. 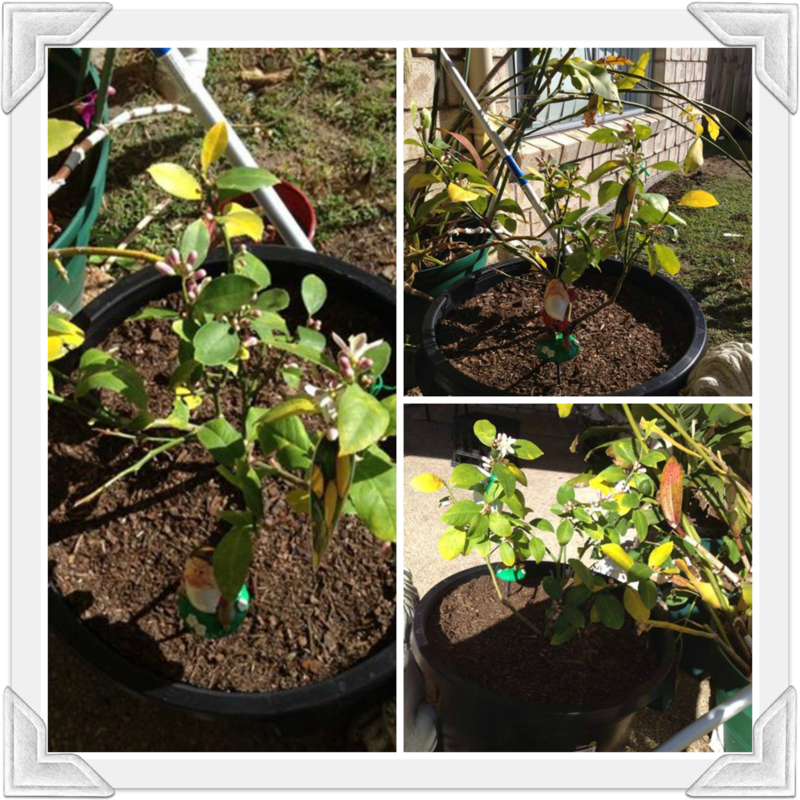 I will post up all the other potted plants in another blog. I need to take some nicer looking photos of everything, and make it look pretty =P I will also add some close ups of the lemon blossom flowers as well Including the new additions to the front garden.